WASHINGTON, Sept. 17, 2002 -- EV Global Motors Co. is voluntarily recalling about 2,000 lithium batteries in Mini E-Bike electric bicycles. The lithium ion batteries in these bicycles can overheat and pose a fire hazard. EV Global Motors has received five reports of the batteries overheating, three of which caught fire, though no injuries have been reported. The recalled lithium ion batteries are used to power EV Global's folding Mini E-Bike. The battery, which is located in the battery compartment just in front of the seat, is supplied with most models of the Mini E-Bike. The words "mini e-bike" are printed on the side of the bicycle near the steering column. These bicycles are manufactured in Taiwan and the battery packs are assembled in the U.S. Bicycle, automobile and Internet retailers nationwide sold the electric bikes from February 2001 through July 2002 for between $1,400 and $1,700. Consumers should stop using these bicycles immediately and contact EV Global at (888) 875-4545 between 8:30 a.m. and 5 p.m. PT Monday through Friday for information on receiving a free replacement battery and charger. Consumers also can log on to the company's web site at www.EVGlobal.com. The firm also will extend the warranty of the battery from 6 months to a year. WASHINGTON, Sept. 9, 2002 -- Eastman Kodak Company is voluntarily recalling about 75,000 DC5000-model digital cameras worldwide. Due to a manufacturing defect, consumers using these cameras can suffer an electrical shock. Kodak has received 12 reports, including six in the U.S., of consumers who experienced a shock while changing batteries, or installing or removing the memory card or USB cable. There have been no reports of serious injury. These are Kodak DC5000-model cameras. The brand name and model number are written on the front of the camera at the bottom right-hand corner. All DC5000 cameras carry a plate on the bottom of the camera containing the Kodak product identifier reading "KJCAA" followed by an eight-digit serial number. The serial number range is 01800001 through 11700825. Department, electronic, computer and camera stores, as well as mail-order and web retailers sold these cameras nationwide from June 2000 through August 2002 for between $600 and $700. This recall includes the DC5000 model only. No other Kodak cameras are affected by this recall. WASHINGTON, Sept. 9, 2002 -- As children and adults perfect their lay-ups in driveway basketball courts across the country, the U.S. Consumer Product Safety Commission (CPSC) announces another recall of portable basketball hoops. Huffy Sports Company is recalling about 70,000 portable basketball systems. 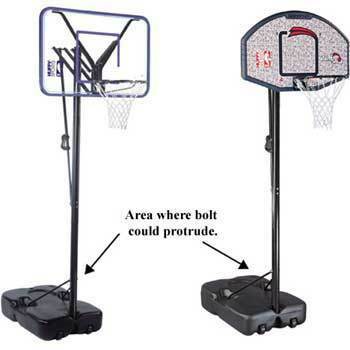 The basketball hoops can have a sharp protruding bolt on the player's side of the pole that can cause serious leg or body lacerations to consumers. Basketball players can be cut when they collide with the pole as they drive toward the basket or when they fall or are pushed into the pole. CPSC and Huffy Sports have received 11 reports of injuries from protruding bolts that include scrapes and lacerations. Ten consumers required stitches for their injuries. These are portable, vertically mounted Huffy-brand basketball systems that come unassembled with a plastic base that is weighted down by either sand or water that is added during assembly. The basketball poles are painted black and the Huffy brand name appears on the backboard, main pole, or plastic base. The protruding bolt on the player side of the pole is located about 20-inches from the ground. Sporting good, department and toy stores sold the Huffy-brand portable basketball systems from November 2001 through May 2002 for between $100 and $200. Consumers should examine their units immediately. If there is a protruding bolt in the area of play, contact Huffy Sports to receive free bolt covers. Consumers can contact Huffy Sports at (800) 558-5234 between 8 a.m. and 4:30 p.m. CST Monday through Friday or the firm's web site at www.huffysports.com. WASHINGTON, Sept. 4, 2002 -- Lawn-Boy Inc. is voluntarily recalling about 36,000 Lawn-Boy walk-behind mowers. The vendor who manufactured the mulch plates for Lawn-Boy used the wrong material, making the plates brittle and easy to crack or break if struck by a stone or stick while mowing. Objects coming through a broken plate or pieces of the plate could possibly injure the operator or bystanders. Lawn-Boy has received five reports of broken mulch plates. No injuries or property damage have been reported. The recall is being conducted in cooperation with the U.S. Consumer Product Safety Commission (CPSC). The recall includes 21-inch Lawn Boy Easy Mulch Silver, Silver Pro and GoldPro Series walk-behind lawn mowers. The mowers have the words "EASY MULCH" printed on the top of the mulch cover plate in bold black letters. A model and serial plate is located on the right rear of the mower housing. Lawn-Boy dealers, department and home center stores sold the mowers nationwide from February 2002 to August 2002 for between $250 and $580. Consumers should stop using these mowers in the mulching mode immediately and contact Lawn-Boy to receive a replacement cover plate. For more information, consumers can contact Lawn-Boy toll-free at (866) 336-5207 between 8:30 a.m. and 9:00 p.m. ET Monday through Friday, 8:30 a.m. to 5:00 p.m. Saturday, and 10:00 a.m. to 6:30 p.m. Sunday. Consumers may also visit the firm's web site at www.lawnboy.com.